Yesterday in Toulouse the Airbus A350-1000 took flight for the first time, embarking on a yearlong flight test campaign before Qatar Airways puts the first delivery into commercial service in late 2017. 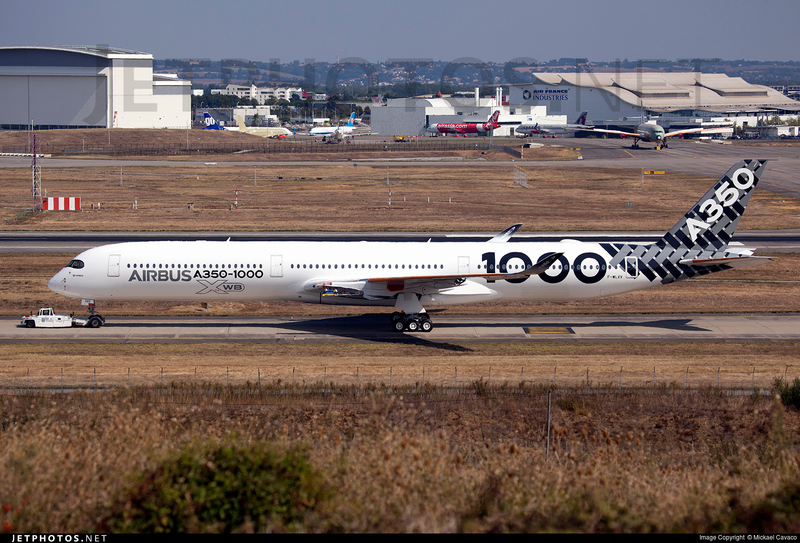 The A350-1000 is the stretched sibling of the A350-900, which entered service in 2015. As of October 2016, Airbus had 195 orders from 11 customers for the A350-1000. The A350-1000’s first flight lasted four hours and 20 minutes, covering 2,056 kilometers. Much of the flight, like many first flights, was conducted with the landing gear extended. 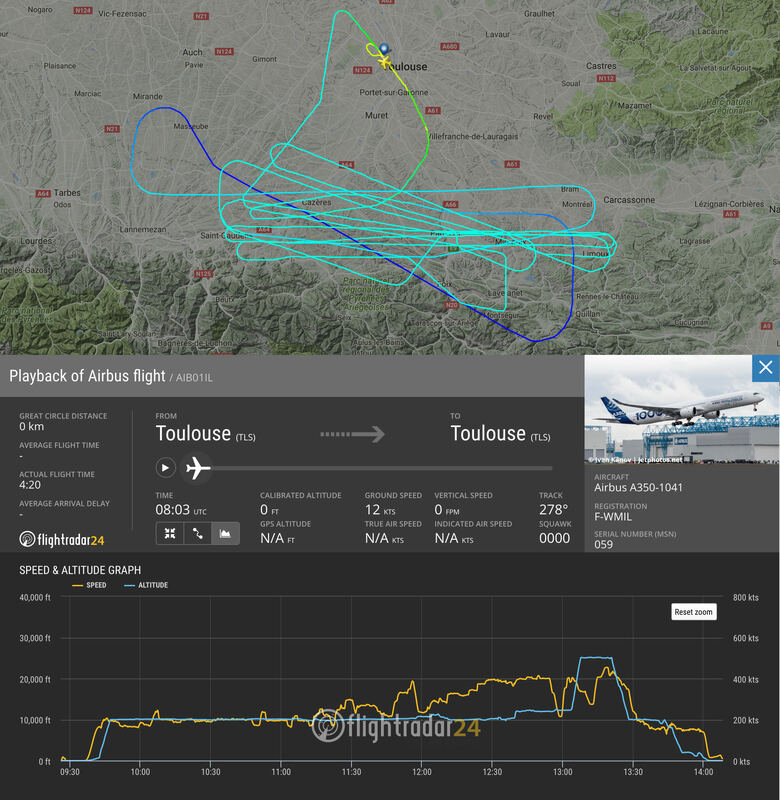 The flight stayed close to Toulouse, flying east and west just south of Toulouse then made a low pass over the airport before landing. In the image below, we’ve included the flight track and speed and altitude graph. 📼 See full playback of the flight. Airbus captured photos and video of the first flight from inside the aircraft and from a chase plane. The JetPhotos catalog also continues to grow, with new photos of the A350-1000 being added by photographers who were lucky enough to capture the first flight. 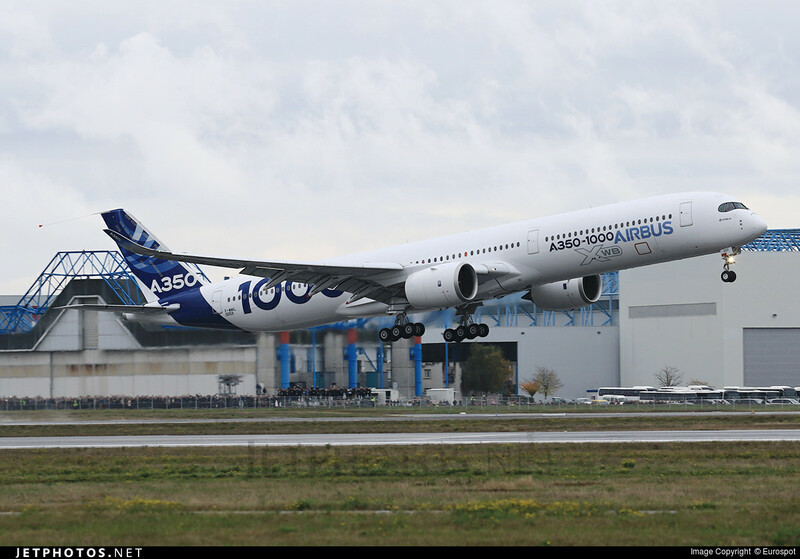 Airbus will use three three airframes during A350-1000 flight tests. The first two, MSN 059 and MSN 065 have been unveiled, while the third, MSN 071, is still in production. In addition to the three test airframes, Airbus is using A380 MSN 001 to test the Rolls Royce Trent XWB 97, the engine that powers the A350-1000. Follow the A350-1000 flight test campaign with the registrations below, or use aircraft type code ‘A35K’ to follow all A350-1000 aircraft.